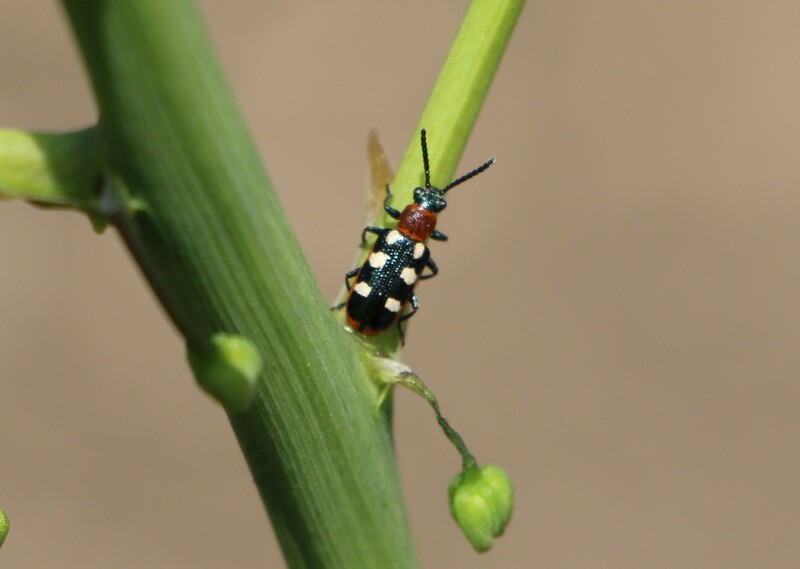 Our young asparagus plants have been attacked for the first time by asparagus beetle, Crioceris asparagi. It is small, not much more than ¼ inch long, but readily identified from its distinctive markings: black head, reddish brown body, black wings with six white markings. 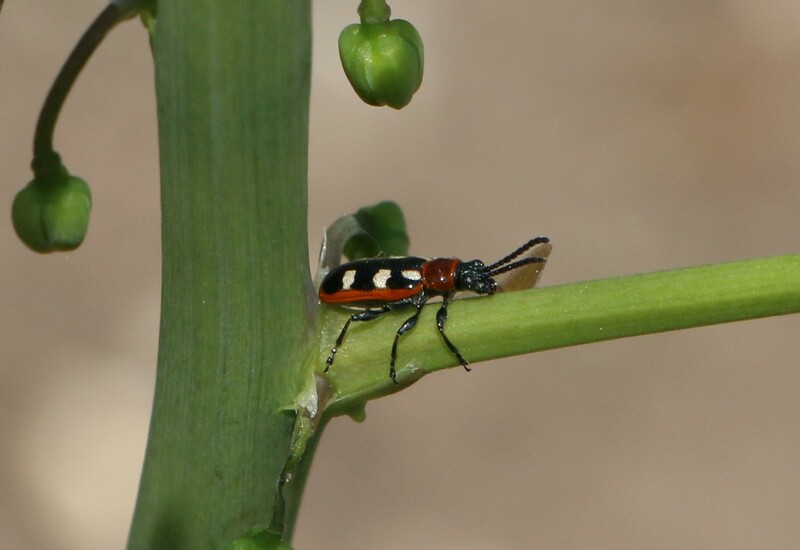 Both the adult beetle and the larval stage will feed on the leaves and stems. If sufficiently damaged, foliage, and even entire stems, can be killed. This may weaken the crowns and can have an impact on the following season’s harvest. Adults overwinter in the soil, climb the young spears and lay their eggs. Their lifecycle is quick: eggs hatch within one week, feed for a couple of weeks, then go to ground to pupate, emerging after a week or so as adults to begin the cycle once again. Growing on a small scale in the kitchen garden, vigilance is perhaps the best defence, removing the beetles and larvae before the damage becomes significant, and this has been our approach thus far. They are a bit tricky to spot, even with their distinct markings, and they are easily dislodged to fall on the ground, where there is little chance of finding them. Ladybirds are said to help control asparagus beetle, presumably feeding on the larvae rather than the adults. We generally have a good population of ladybirds, but have yet to see them on the asparagus. If the infestation gets out of control, organic pesticides such as those based on pyrethrum can be used, although one must be cautious in deploying any non-selective treatment, as beneficial organisms may also be affected. We are hoping to manage without such sprays and to keep numbers under control so that the plants do not suffer unduly. Now they have found our patch I suspect some at least will survive and go through winter to infest the plants each season so we will have this to look forward to again next year. Keeping the site clear of dead foliage and other debris may help to remove beetles that might otherwise overwinter.